A few months back I picked up a packet of US Army training regulations and manuals that were published in the 1920s and deal with mapping and aerial photography. Army publications from this era don’t often appear on eBay, and those dealing specifically with mapping, surveying and related topographic sciences are even rarer. In fact, after years of hunting on eBay for historical publications dealing with these topics this was the first time I’d ever seen any from the inter-war period. My guess is that virtually all outdated documents got heaved into the garbage can in the late 1930s as the Army was ramping up for war and new publications covering map production and map reading were introduced. I was surprised to find myself in a small bidding war for these documents. I’m sure it wasn’t against anyone with a specific interest in Army topographic history. The other bidder(s) were more likely motivated by the relative rarity of the documents. In the end I paid about $30 for the packet and at the time I thought I’d bid too high. As it turns out I think I made a good investment. As a group these manuals represent an interesting view into the evolution of Army mapping activities that incorporate the lessons learned and the new technologies that emerged from our experience in WWI, particularly the use of aerial photographs as map substitutes and as base data for topographic map compilation. In these documents you get the sense that the Corps of Engineers is starting to realize that it now has significant responsibility for providing standard map products to a modern Army with a potential world-wide mission. Most of these publications cover topics I’m well familiar with, but the Harriman Geographic Index System is something I’d never heard of before. Once I read through the document I realized that the Harriman system is designed to allow a Soldier to accurately locate himself or any feature on a map to within a few hundred feet anywhere in the world. In essence it is an early worldwide grid reference system (although it bears no resemblance to the current Military Grid Reference System). It is also very complex. While the mechanics of the system were fairly easy for me to figure out, I can’t imagine myself standing in front of a classroom of Soldiers trying to teach this system. It might have been a useful tool for well educated officers working in the relative comfort and calm of a rear-area command post, but for a tired, cold and scared draftee with a 9th grade education who is sitting in a muddy foxhole trying to call for artillery fire support this system is all but unusable. The Harriman system uses the South Pole as the origin point and the International Date Line as the meridian. It successively divides up the Earth into smaller and smaller rectangles based on latitude and longitude. Each of these rectangles get an index number in the Harriman unit system that, when combined, permit locating features to within about half an acre. Since the Harriman system is based on latitude and longitude it is projected onto a spheroid. This means the land areas defined in this system vary with latitude. The further away from the equator the smaller the land area encompassed by a Harriman system rectangle. This also means the Harriman system is not a point identification system like the Military Grid Reference System, but is an area reference system that defines smaller and smaller rectangles on the face of the earth. The smallest area that can be defined in the Harriman System, the Position Unit, is 2 seconds in latitude and 1 second in longitude. This equates to about a 4,875 sq. ft. ‘box’ at 49 degrees latitude, or about a 70 ft x 70 ft area on the ground. The Harriman system has the potential to identify a point feature such as a road intersection with a positional accuracy that is well within the map accuracy standard for a 1:50,000 topographic line map. From a practical perspective Harriman’s system is accurate enough. But it’s the identification of these units that can get confusing. The Harriman system requires the user to concatenate an ever longer string of numbers, separated by colons, semicolons and slashes, to identify locations. The smaller the area the longer and more confusing the string. For example, according to the manual the Harriman system ID for Battery Byrne at West Point would be designated as 2665:4515; 7792. Users of the Military Grid Reference System (MGRS) could argue that this system can be just as confusing. 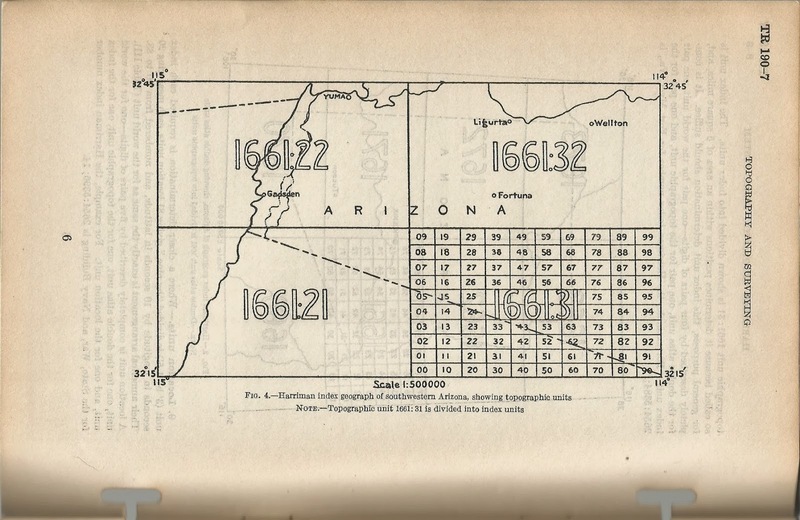 However, I’d counter that the MGRS use of the grid zone designation (ex: 18T) and the 100,000 meter grid zone ID (ex: WL) alpanumeric system takes a lot of confusion out of sending and receiving coordinate locations. For example, the MGRS coordinate identifier for the same Battery Byrne location is 18T WL 8726 8316. Perhaps it’s my 30+ years of using MGRS that has me jaded, but I just think MGRS is less confusing. In the late 1920s the federal government seemed quite enamored with the system and there are indications that a number of federal agencies had adopted it. In 1928 Congress actually held hearings to decide whether to purchase an unlimited use license from its developer, George C. Harriman. But other than a few tangential references on the web I can’t find any more discussion about it. This training regulation is the only full reference I’ve found. 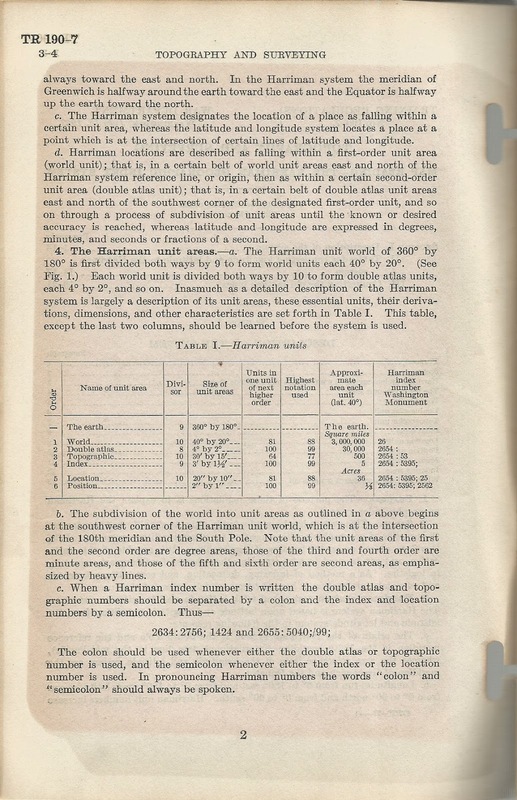 Even more interesting, when reviewing Army topographic references – training and field manuals – published beginning in the late 1930s as the US Army ramped up for war, I find no references to the Harriman system. 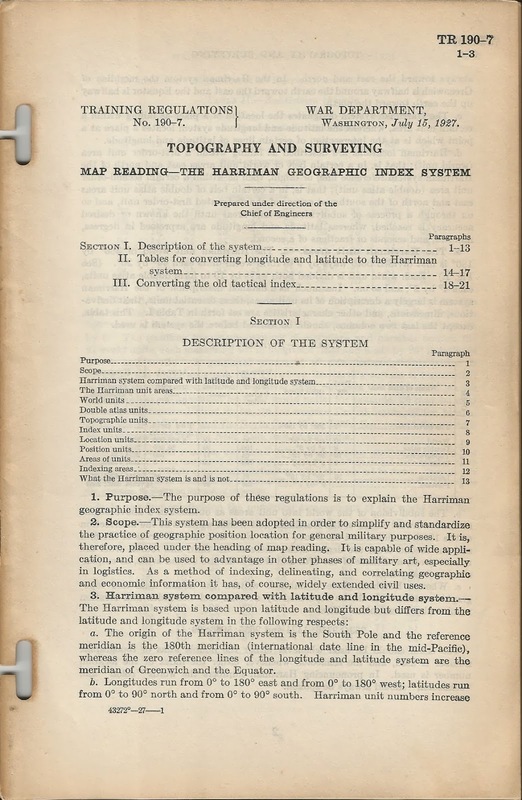 It appears Mr. Harriman’s system was a flash in the pan, dropped by the Army in the 1930’s as the Corps of Engineers realized it needed a better map coordinate system to address the exploding world-wide mapping requirements. The Army needed a coordinate system that was logical, consistent, accurate and easy to teach to the millions of draftees about to be deployed to battlefields around the world. It was out of this requirement that we got the Military Grid Reference System, a system stood the test of time and war. This entry was posted in History, mapping, Publications and tagged harriman by Brian Haren. Bookmark the permalink.